Preferred by the country's top saltwater guides, Spheros reels are built to withstand the abuse Mother Nature dishes out, thanks to its waterproof drag, A-RB bearings and cold forged aluminum spool. And not only can the Spheros take it, it can dish it out too, with up to 44 pounds of drag. 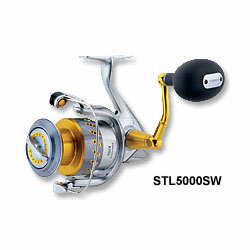 These reels also feature stopperless design (no anti-reverse switch), aluminum frame, graphite sideplate, graphite rotor, S-Arm Cam, Aerowave oscillation (3000–8000 models), Aero Wrap oscillation (14000–18000 models), Power Roller III line roller, Super Stopper II anti-reverse, Dyna-Balance, direct drive mechanism, and Fluidrive II. "I was going to buy VAN STAAL vsb150. but the more i looking into it the bad things come in .so i decide to go with the Shimano Stella SW10000 , after fishing few's times ,needless to said i went back and buy 2 more of the Shimano stella SW5000.... The feature of the reel it so AWESOME and great the casting it awesome and the drag it so SMOOTH like an baby A-- ,Shimano did and GREAT job... This reels will hand down to my grand children and sure it will last and performed like the day i bought......"